When having your child’s friends stay at your house you might want to line up some fun sleepover games for kids. That is unless you want the little ones bored out of their minds and threatening to call their parents to rescue them. Or worse, having the kiddos break out their tablets, isolating themselves all evening. There are some easy-going games to keep young-guns occupied at sleepovers. You can have them do Mad Libs, still popular after all these years! Truth or Dare is another option that you don’t need any game pieces to play. Since emojis have taken over the planet, you can hook up the sleepover attendees with a card game called Emojinks. Now for the not so easy-going fun sleepover games for kids. The games listed above are fine for a while. But youngsters need to burn off energy so they will sleep well. The last thing you need is having the tribe of visitors asking you to entertain them after midnight. With the games listed below your child and their buddies will sleep soundly after hours of physical play. These games reduce stress, provide some cardio work, and help kids with teamwork and dexterity. But mainly they are fun! Let’s say you got roped into a last minute sleepover for ten kids. You should work on your list of excuses when you’re not prepared for a sleepover. But since you’re trapped, make the most of it. Don’t break out Trivial Pursuit unless you never want your child’s friends to visit again. Go with hide and seek if you didn’t have time to go buy a game for the crew. What kid doesn’t like this classic? Make it interesting by awarding the best hider some sort of prize. If you did have time to plan this epic sleepover, then you have lots of options. You can’t go wrong with Twister. 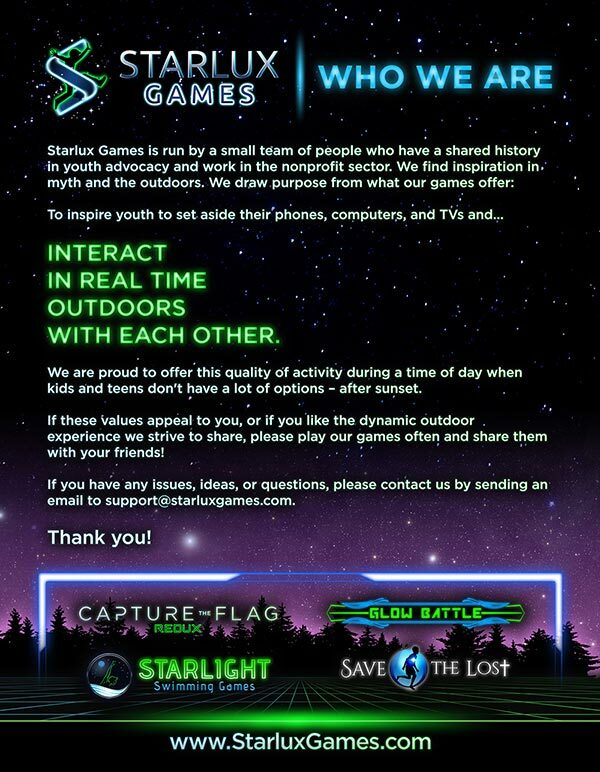 This game can be played outdoors where mankind was meant to play! But in case of rain, the kids can still stretch themselves all over the board in the living room. This game increases flexibility and makes the players use creativity to get the win. For a large group, you may be scratching your head to figure out a game best suited for ten or more children. Don’t freak out and let them take over the remote control. Dad can’t miss the “game of the year”… for the fourth time this month. 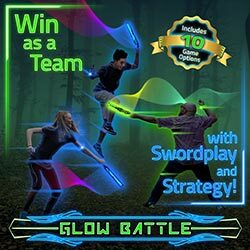 Glow Battle is a fun sleepover game for kids that will never leave them bored. Tired and smiling, but never bored. This game is a light-up saber battle between two teams. There are several variations to keep the tribe playing well into the night. Get dad off the couch for this one too. There will be another so-called “Game of the Century” next week. Wrestling sounds dangerous right? Yes, because everyone freaks out over any activity that could cause a boo-boo. But guess what else causes bodily harm – not moving around! Being still causes obesity, heart disease, and depression. Kids love wrestling in a fair way. No steel chairs to the head. We’re not talking WWE here. Just some light wrestling to have fun. One parent needs to be the ref to lay down the rules and keep everyone safe with this fun sleepover game for kids. You can set up a temporary horseshoes area if you don’t want steel stakes in the middle of your yard. Husbands are known to hit things like that with lawnmowers. So instead, grab a plastic set of horseshoes that you can break out whenever a sleepover happens. This game won’t burn a ton of calories. But there is walking, aiming, throwing, and conversations that happen with this classic outdoor game. Going for a cool-factor with your sleepover? Then it won’t hurt to have a game ready that the kids have never seen. Hover Soccer is the go-to move here. It is best played indoors but can be played on a flat surface outside also. It’s under $10 too (available at amazon). No doubt your child will have requests for more sleepovers when you mix it up from the normal games. Wouldn’t you prefer having kids over to your house instead of your child always staying over at their friends’ place? Last but not least of the fun sleepover games for kids is the old-school potato sack race. Think kids won’t go for it since they are wowed by intense video games? Think again. Racing will never go out of style. Cars, horses, boats… you name it and humans will race with it. And that includes burlap sacks! Kids are competitive and racing in a sack is insanely fun. Want even more ideas? 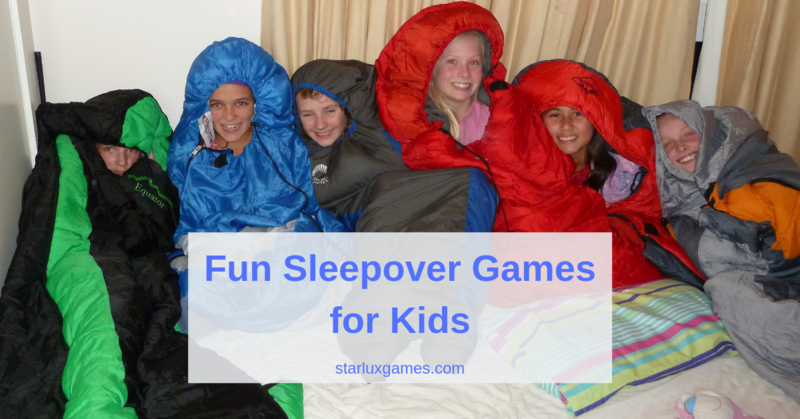 Check out our articles fun sleepover games for girls and fun sleepover games for boys. If you have game suggestions for other parents hosting their first sleepover, then please shout it out. Rookies need help from the vets to keep the kids entertained while spending the night with their friends. The featured image used in this post is by Mike Hauser and can be found here on Flickr.